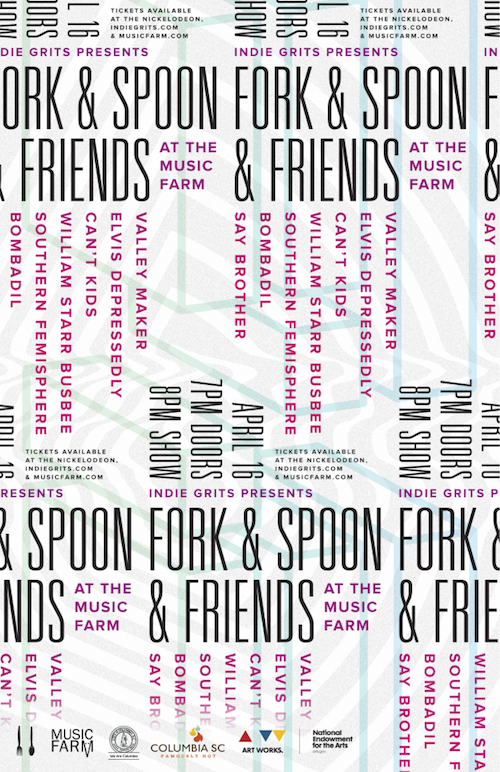 Fork & Spoon & Friends at Indie Grits! If you haven't heard yet, this year is our 5th anniversary of being a record label! To help us celebrate, Indie Grits Festival is helping us throw and epic party at the Music Farm Columbia along with seven bands spanning from our Fork & Spoon Family and friend group. Playing over the course of the night is SOUTHERN FEMISPHERE, WILLIAM STARR BUSBEE, CAN'T KIDS, ELVIS DEPRESSEDLY, BOMBADIL, VALLEY MAKER, & SAY BROTHER! Doors at 7pm. Music at 8pm SHARP! $8 advance/$10 at the door. COME OUT AND CELEBRATE WITH US!